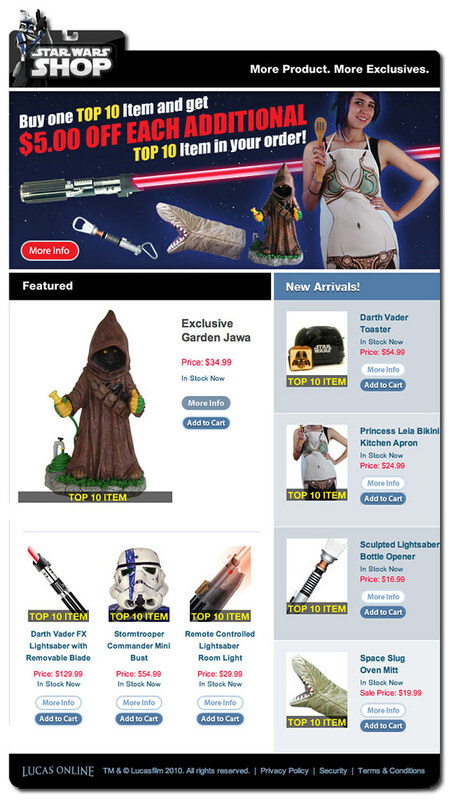 I just saw an exciting email from the Star Wars Shop! If any of you out there may still have some holiday shopping to do, you can take advantage ofÂ StarWarsShop’s new “Top 10”Â category, featuring some of their best selling and most giftable items. Among the items listed is *ahem* the Slave Leia apron that I DESIGNED! SO, for a limited time you can buy one item in the “Top 10” category and receive $5.00 off each additional “Top 10” item in your order. The discount will be applied in Step 4 of the checkout process. Offer ends December 31, 2010. Think we can be of assistance to each other. Have a couple of attachments to send. Think with your artistic skills and newer age computer skills, and my mathematical analytical skill, over two decades older than you plus technical knowledge computer structure, we can take on the AZ Photo Radar. Nickname (alias) me “Hob Elwald” (Scottish Boarder Reveir). 😀 thanks for the offer, but like I replied to your last comment, it would appear that the judge was bound by justice to find me not responsible.